Opel's Lohscheller is copying PSA's recovery plan. 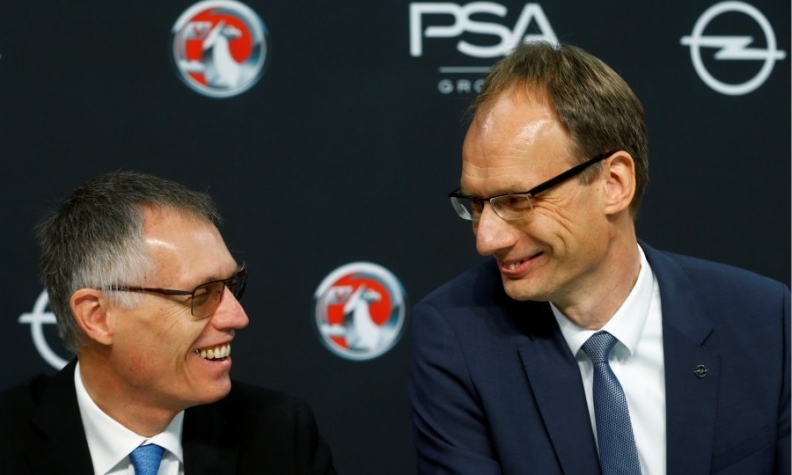 He is pictured, right, with PSA CEO Carlos Tavares during a press conference to announce Opel's PACE plan. PARIS -- Opel's strategic plan to return to profitability looks a lot like PSA's successful road map after it escaped bankruptcy four years ago. But Opel's recovery is not guaranteed and analysts said weaker demand in its main markets and the challenge of disruptive technologies loom ahead. A comparison of Opel's new strategy, called PACE, which CEO Michael Lohscheller announced Thursday, with PSA's Back in the Race and Push to Pass plans under CEO Carlos Tavares, finds many similar targets. That's by design. Speaking at the Frankfurt auto show in September, Tavares said that while Opel management would be creating the plan, PSA was supporting them with the best practices and methodology from its Back in the Race strategy, which brought PSA from negative 2.8 percent automotive operating margin in 2013 to a positive 6 percent in 2016. "Of course, when they need me I'm always there to discuss and give them my recommendation," Tavares said at the show, "but it has to be their plan." Tim Urquhart, an analyst at IHS Markit, said it was important that the plans resemble each other to foster corporate unity and sense of purpose. "It was delivered from an Opel perspective, but it is Tavares' plan," Urquhart said. "A lot of the metrics they are targeting are ones we've already seen in Push to Pass. They want the uniformity of working together, the uniformity of corporate strategy." Production savings. Opel aims for cost-cutting of 700 euros per car, with 400 euros coming from manufacturing and logistics alone. PSA is also seeking to trim 700 euros per unit, according to the Push to Pass plan, which Tavares released in April 2016. Operating margin. Opel will have a positive automotive operating margin of 2 percent by 2020, and 6 percent by 2026, Lohscheller said. Tavares had aimed for a 2 percent margin by 2018 and 5 percent sometime after 2019 -- but he reached 5 percent by 2015. Reducing complexity. Tavares vowed to halve PSA's lineup to save money in 2014. Opel plans to move to only two PSA platforms from the nine used currently, and to four engine families from 10. Breakeven point. Tavares emphasized in Russelsheim that reducing PSA's breakeven point from 2.6 million vehicles in 2013 to 1.6 million, while producing 3 million vehicles a year, puts the company in a "very healthy position." In comparison, Lohscheller is seeking to trim Opel's breakeven point to 800,000 vehicles from an undisclosed number in order to "create a shield to protect the company against headwinds generated by the challenging environment that the automotive industry is facing these days." Pricing. Tavares called this "paramount to the profitability of the company." In 2013, Tavares noted that Peugeot brand pricing was 6.5 percent below the benchmark, and sought to close the gap to 3 percent by 2020. After reducing sales in unprofitable channels and introducing new SUVs and crossovers including the 3008 and 5008, PSA says Peugeot will be just 1.3 percent below the benchmark next year, and is aiming for a better-than-benchmark number by 2021. Opel, too, is aiming to improve pricing, now 5.6 percent below benchmark, with similar methods: two new SUVs this year (co-developed with PSA), with another coming in 2019, and the introduction of a new, top-line Ultimate trim level. "You can't make money if you're consistently underselling your products," Urquhart said. Labor issues. Both Lohscheller and Tavares emphasized that Opel will reach its targets without forced layoffs or plant closings, and Tavares noted that PSA had reduced fixed costs by 1.2 billion euros since 2013 without layoffs or closings. The key figure under Tavares is wages to revenue, Urquhart said. The Back in the Race plan aimed to reduce that figure to less than 12.5 percent (a goal reached in 2015). Opel's PACE plan aims to reduce it to "benchmark levels." "These are important strategic hardpoints that they need to be hitting to make the thing work," Urquhart said. "There's an internal logic there, and you can see Tavares's thumbprints all over it." However, while Tavares was able to easily outperform his own targets after taking control at PSA in late 2013, there is no guarantee he can reproduce his success with Opel, which PSA bought from General Motors in August, after GM tired of years of losses at its European division. Opel is starting from an arguably weaker financial position than PSA was in 2013. "Opel's presentation conveyed the same messages PSA gave us four years ago but Opel differs from PSA in many important respects," Morgan Stanley analyst Harald Hendrikse said in a note to investors. PSA's financial issues in 2011 and 2012 were largely cyclical and the company recovered in tandem with a general improvement in the European economy, especially in southern Europe. Opel, however, has continued to lose money during the recovery and while its two main markets, Germany and the UK, "are close to all-time highs," Hendrikse said. Those markets are now showing weakness. The auto industry is also facing fundamental and costly technology shifts in electrification and autonomous driving systems. Tavares can now amortize general development costs among more brands and an additional 1 million units, but those future technologies will require great investments at a time when PSA will have to absorb near-term losses at Opel. "The real hard stuff is electromobility and autonomous drive, and they are huge, huge costs. It will be very, very difficult," said IHS Markit's Urquhart.